Return to White Catcliff is Inna Val Helm’s debut novel presented by an unforgettable cast of characters. Fantasy and reality merge amid elements of anthropomorphism, eternal life, and dimensional existence. It tells the story of thirtysomething Nick Taylor and his black Lab, BD, who stumble upon a convenience store robbery in a suburb of present-day Chicago and are left for dead. 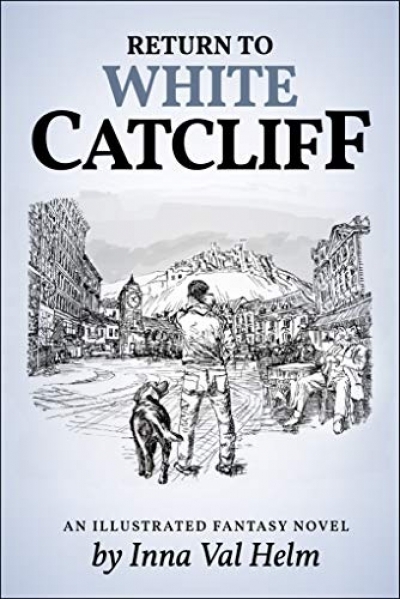 They awaken to find themselves in the tranquil village of White Catcliff, where inhabitants faced certain death immediately prior to arrival. The antagonist is VEIL (Volunteer Eleemosynary Institute and League), which presents as a humanitarian organization, but its true agenda is steeped in pillage and plunder. Nick’s mission is to stop its proliferation.